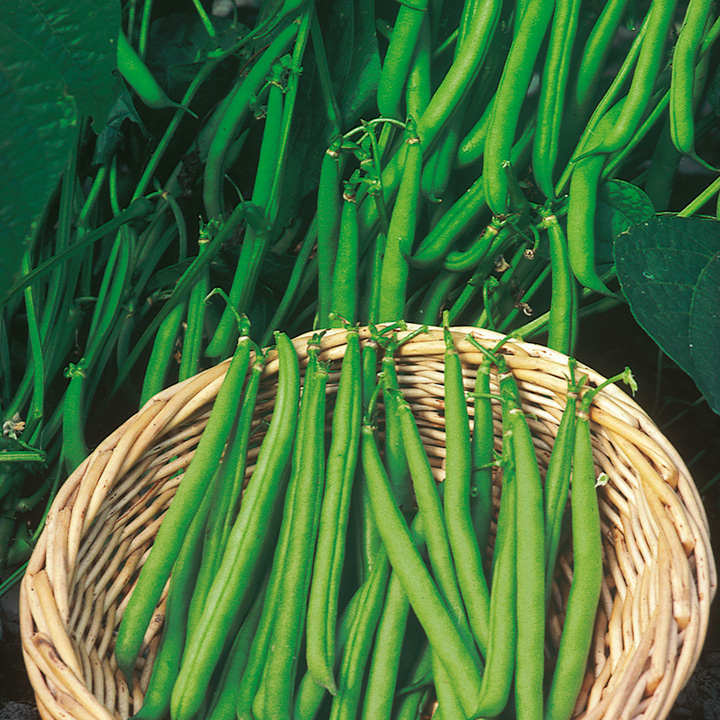 An outstanding dwarf french bean producing high yields of 15cm (6") long, slender, straight, round pods that are stringless and full of flavour. They have a good shelf-life, but also freeze well. Resistant to Anthracnose, Halo Blight and Mosaic Virus. Maturing time 12 weeks from sowing. Also known as Kidney Beans. RHS Award of Garden Merit winner. Short bushy plants produce heavy crops of delicious, slim, fleshy beans. For early crops in June, sow mid March onwards in rows 30cm (1') apart and 5cm (2") deep, setting the seed 15cm (6") apart. Cover with cloches to exclude frost. For July-October crops sow from late April onwards in rows 60cm (2') apart setting the seeds 15cm (6"). Row 18m (60'), except where stated. For early crops - sow in pots and plant out. Use polythene or fleece to warm soil prior to sowing. HEALTH BENEFITS: Medium levels vitamin A (For growth, healthy hair, skin, bones, teeth and eyes as well as resistance to respiratory infections). COOKING HINTS - Use fresh or freeze. Cook pencil types whole or slice flat types. Never eat pods raw.